Full story : iDraw By Indeeo, Inc.
Design a new logo in minutes using the flexible design tools of Logo Design Studio Pro. Easily choose from over 1000 pre-designed logo templates, or start from scratch using over 2800 premium logo-centric vector graphics and shapes to jumpstart your creativity. Then add or change text, shapes, color gradients and more to get your look right. Animate : Bring your imagination to life! Anime Studio is your complete animation program for creating 2D movies, cartoons, anime or cut out animations. 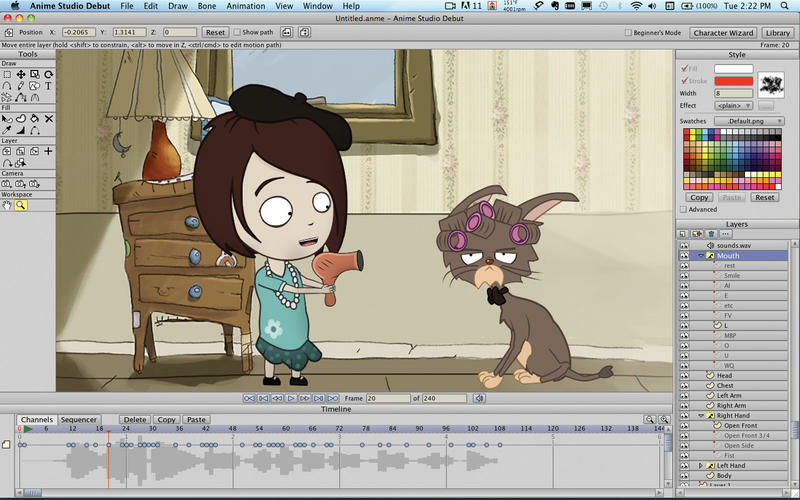 Create your own desktop animated shorts, or use it to produce animations for film, video or streaming over the web. Get started quickly with the Beginner’s Mode. Create your own custom characters using the built-in Character Wizard and convert your existing paper drawings into ready-to-animate vector images with one click. Draw your own artwork using built-in brushes, import digital photos, add sound and video, and choose from pre-designed characters or create your own and make them talk using integrated lip-synching. The revolutionary bone rigging system makes animating fast and an efficient alternative to tedious frame-by-frame animation. Just as with their iPad version, TouchDraw is a retina optimized application that gives you everything you need to create structured 2D vector graphics such as flow charts, graphs, diagrams, illustrations, logos and floor plans just to name a few. TouchDraw for the Mac is fully compatible with the iPad version and files can be freely exchanged between both versions. Clipart Collection is a set of 500 pictures useful for incorporation into your Keynote presentations, iWeb sites, iBooks Author textbooks, Pages or Numbers documents and other applications. It is even compatible with MS Office programs like Word, PowerPoint or Excel. A great variety of colorful images with transparent backgrounds are sorted into 21 categories, which vary a lot and include Business, Science, People, Holiday, Nature, Food, Sports and more. VectorPro Color builds on the successful VectorPro automatic tracing platform and adds in basic grayscale and color vector tracing. VectorPro Color for Mac automatically traces high quality vector files from images. An excellent companion to the many lower cost illustration programs available in the Mac App Store, this app completes a full-featured design toolbox at a very low cost.